Projects at Harvard is a free web site building tool available to groups at Harvard wishing to create a site for their project. It is one of two main Harvard installations of OpenScholar and a creation of Harvard’s Institute for Quantitative Social Science. 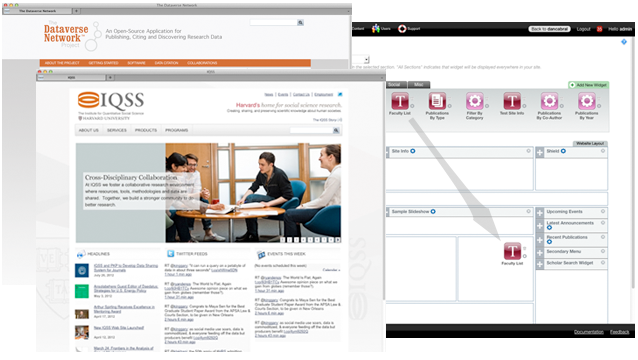 Projects at Harvard (and the personal site-oriented Scholars at Harvard) provide simple web site creation and management with a suite of features tailored to the particular needs of academics. Create anything related to an academic site. Your mission statement, bios, publications, a blog, image galleries, class materials and more. Control the look and feel of your site. Move useful widgets in and out of your site; change menus, and the overall look of your site in seconds. Easily build calendars; highlight upcoming events. The built-in content forms and WYSIWYG editor makes it simple to publish. You can begin writing content from almost anywhere on your the site. All pages are given URLs which correspond to the page's title. No need to suffer with nonsensical URLs such as: "hdc.do?keyword=icomon&tabgroupid=icb.tabgroup50611". Increase visibility and optimize the availability of your sites' pages in search engines, such as Google and Yahoo! with semantic URLs. "Out of the box ready" content features, which provide sections of your site. Features can also be set to "private", thus viewable to only members of the project. Keep the web sites fresh by pulling in content from relevant sources using RSS. Projects at Harvard provides built-in tools for RSS feeds making feeds easy to set up. Design page layouts using a visual "drop-and-drop" blueprint of the site. The Layout Tool provides an easy (and fun!) way to arrange the content presentation on any site. Each site owner can design site-wide default layouts or create unique layouts for different sections of their site. Easily share web pages on other social networks such as Facebook and Twitter. Project Managers have the ability to distribute bookmark links to a variety of social network sites quickly and easily. Just provide your Google Analytics ID and data from your Projects at Harvard site will be sent to your Goggle analytics account automatically.